A → New Product or service may be launched either from within an established management system or from a brand-new operation. In both cases, autonomy is a precondition of success however. 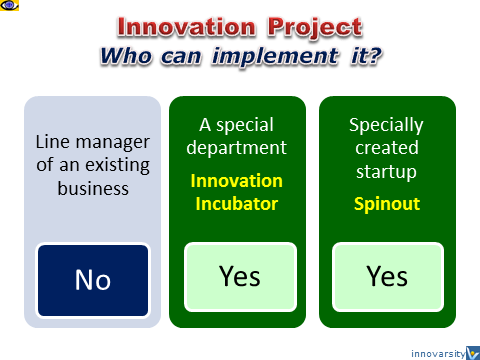 Innovation needs to be managed separately as the established company would load insupportable burdens on the new venture: burdensome examples include highly structured reward schemes, return-on-investment targets, and lack of clear accountability for the venture. There is the fundamental difficulty in converting a large and/or non-flexible organization, which has built up policies, people, and practices along set lines, into the anarchic modes of the entrepreneur. To picture the problem, just imagine you forcing your right leg to run while your left leg and the rest of your body keep walking. "The most important caveat is not to mix managerial units and entrepreneurial ones" in any way. Venture values are different from established corporate values. Entrepreneurial management of the venture-building process is also fundamentally different from corporate management that is focused on delivering the annual operating plan. Not only must "the entrepreneurial, the new" be organized completely separately from "the old and existing", but "there has to be a special locus for the new venture within the organization, and it has to be pretty high up". the government leaving him alone.